Just a short drive east of our Fort Walton Beach hotel, you’ll find big fun at Big Kahuna’s Water & Adventure Park in Destin. Let’s not forget the Holiday Inn Resort has the best pool on the beach, with its lazy river, cascading waterfalls and seasonal pirate and mermaid shows. But if you’re looking for a little less relaxation and a little more action, please, then pop down the highway to Big Kahuna’s. 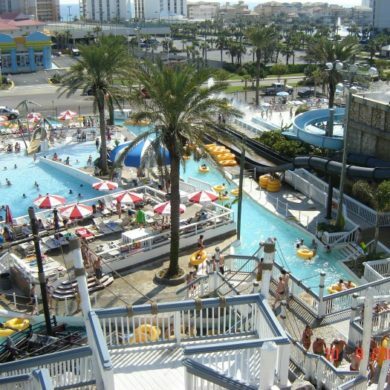 A Destin landmark for decades, the park features more than 40 water slides, play areas, rides and pools. The Kowabunga Racer is the newest attraction. Riders 42″ and up can grab a mat and slide down a 4-lane drag strip plunging five stories! For the moderate thrill seeker, there’s the Hammerhead and Cobra Twister. Kids love the Monkey River, a winding slide. There’s also a splash pad for small children to play in shallow waters. Ride on a tube through the rapid rivers, or check out the pirate ship in Bombs Away Bay. There’s something for everyone, no matter how tall or how fearless. In the adventure park, the Sky Coaster hangs riders 100 feet in the air and spins you in speeds of up to 60 MPH. There’s also a wave you can surf, or tropical mini golf. When you get hungry, hit the Gulf View Food Court for nachos, pizzas, burgers and more. Big Kahuna’s is open seasonally from late spring to late summer. Once school starts, they are only open on weekends. View the operational calendar on their website. Lockers are available to store valuables. Cameras are not allowed on slides. Group rates can be arranged, and military discounts are offered. Children under two years of age get in free. You’re sure to have a BIG time at Big Kahuna’s. Big Kahuna’s is located at 1007 U.S. 98 in Destin FL. For more information, please visit the Big Kahunas website or call (850) 837-4061.